The Earth’s water supply is stressed, and farmers use a lot of water to grow crops. What are some of the technologies available to help them grow more food with less water? Our water supply is stressed! Water is essential to all living things. Humans, animals, and crops rely on a steady water supply in order to survive. But, with a growing population and a finite water supply on earth, we are finding ourselves in a bit of trouble! While about 80% of the Earth’s surface is covered with water, it is the fresh water supply that we are most concerned about. Freshwater assumes only 2.5% of all water on Earth – and 90% of this fresh water is located in Antarctica. To put that into perspective, if you were to take all the world’s water and fit it into a one-gallon jug – fresh water would only account for roughly one tablespoon. Based on current projections, our population is expected to grow .89% per year through 2050. At this rate, that is approximately 66 million more mouths to feed each year! Thus, our farmers are expected to not only produce more food but to use less water throughout the growing process. So, as shifting rainfall patterns, frequent droughts, and population growth put added stress on our water supply, farmers are looking to technology for new ways to reduce, manage, and reuse fresh water. Water on Earth is a closed system. There is the same amount of water on our Earth today as there was two billion years ago, but it may be in a different form. 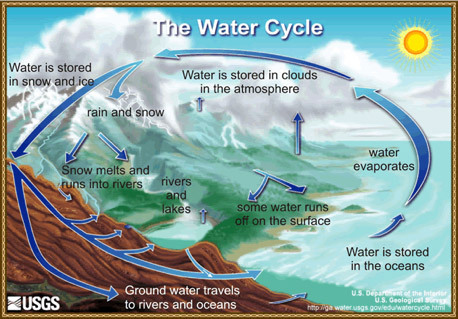 Water on earth is recycled daily through evaporation, condensation (clouds), precipitation (rain, snow, or hail), filtration down through the earth, and surface run-off. Consider this: When you drink a glass of water you could be drinking the same H20 molecule that your Grandmother met when she got caught in the rain 50 years ago! That same H20 molecule may have also met the dinosaurs 200 million years ago or, more recently, George Washington in 1789! Growing crops and raising animals requires a lot of water. Worldwide farming activities account for approximately 70% of freshwater withdrawals. Farming in the mid-west, for example, requires millions of gallons of water to keep crops and livestock healthy and happy. These farms utilize rainwater as well as underground aquifers. After this water gets used on the farm, it can take a lifetime to make its way back into an aquifer. In addition to recharging groundwater, water can also run off into streams and/or rivers and end up in the ocean. It may also be evaporated! Water is rarely used in the same way more than once. The biotech approach begins with engineering seeds and crops that can grow with less water and have drought resistant properties. The computer-related approach includes aerial imaging, sensor networks, data analytics, and social networking. These systems are helping farmers optimize their water inputs, create smarter irrigation systems, and communicate with each other on water-saving techniques. Advancements in filtration and membrane technologies have made it more cost-effective for farmers to conserve water. Absorbent soil additives can increase the amount of water the soil can retain and release throughout the growing season. If you are an environmentalist, then drought-resistant genetically modified organisms (GMOs) are the answer to your water concerns. Seed producers are using biotechnology to create seeds that can grow a water-efficient, drought-resistant crop. Breakthroughs in seed technology can help farmers around the world growing in different climates optimize water use. One of the primary water-related issues farmers face is: where to put the water— as some parts of their field often need it more than others. Thanks to computer-related technologies (aerial imaging, sensor networks, data analytics, and social networking), farmers can now determine where the drier part of their field is located. The goal of agricultural aerial imaging, sensor networks, and digital tools (such as data analytics) is to perfect irrigation techniques. When the sensors detect low soil moisture in a specific area or crop, the control network will turn on the computer-automated irrigation system and turn it off when an optimal amount of water is delivered to that zone. 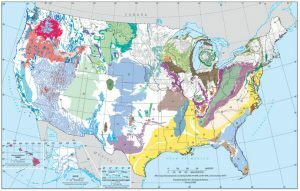 A single field can differ in slope, land elevation, exposure to the sun, and/or contain various soil types (i.e., mineral and clay content, sandiness, etc. ), all of which affect the amount of water needed to grow crops. The development of these computer-related technologies is to allow farmers to more precisely deliver water to meet crop needs on a real-time basis. In a previous article, D2D described how the use of aerial imaging captured by drones, satellites, and aircraft has been “taking off” in the farming industry. Large farms today can synthesis data from the fields, the animals, the machines and the barns to run more efficiently. 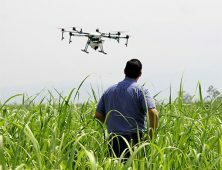 Normally, growers manually evaluate their soil moisture, crop health, and potential yields on foot or by tractor, but aircraft or drones can quickly fly over their field or satellites can produce a bird’s eye view of the field generating more accurate data often at an accelerated pace. The data produced by the satellite or aircraft imagery can be directly downloaded to a farmer’s smartphone or tablet allowing the farmer to adjust their field management accordingly. There are many drone companies offering imaging services. Searching the internet for aerial crop imaging companies brings up dozens of entries. However, many of these companies provide only images without any analytics or “actionable intelligence” to make sense of what is shown. DroneDeploy and Agribotix are two startups that offer both imaging services and analytic software platforms where farmers can analyze images taken from their personal drones. Another imaging-as-a-Service company, CeresImaging, captures high-resolution images at specific wavelengths by flying close to the ground. Using various image processing techniques, they generate highly accurate data on every plant in the field then use biological and mathematical modeling to correlate this data to the plant’s physical properties. Similar to aerial imaging, wireless sensor networks create a smarter irrigation system that allows farmers to customize irrigation to a field’s unique needs. 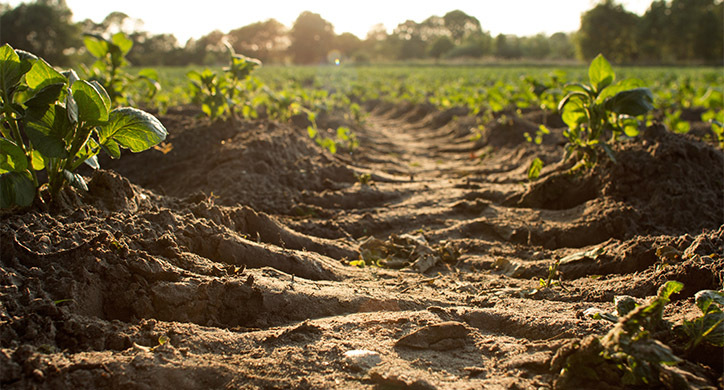 The sensors are placed around a field and continually report various soil measurements, including moisture levels, directly to a computer, tablet, or cell phone. The farmer can then take that information and act on it. 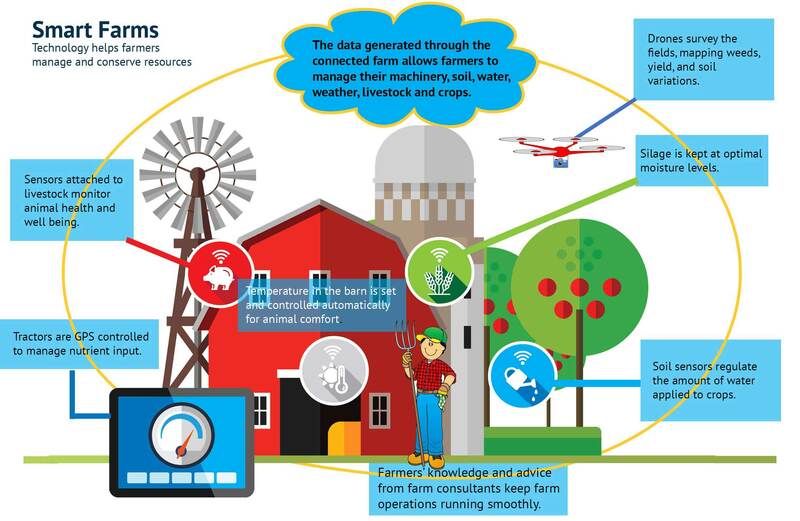 More advanced sensor systems have control networks installed in a field’s irrigation system. CropX, a company with offices in Tel Aviv and San Francisco uses publicly available data to generate algorithms for a particular piece of land. After formulating the algorithm, they use data from sensors strategically located within a field to generate detailed information about how much water is needed as well as where and when it is needed. Raptormaps is another company that combines sensor technology with analytics to provide farmers with information to optimize crop inputs and to make decisions based on field and crop conditions. 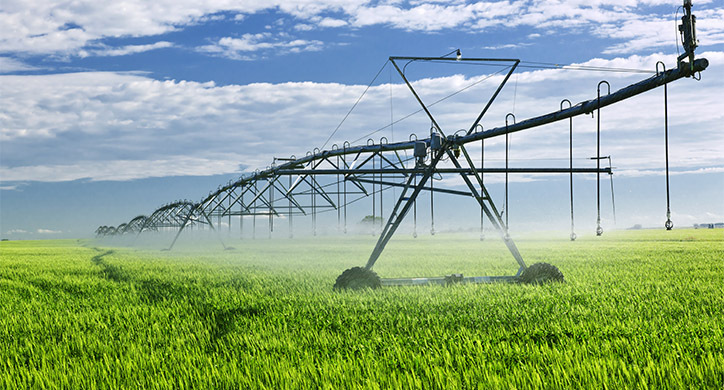 Additionally, pressure and acoustic sensors wirelessly connected to a cloud-based monitoring system can be attached to a field’s irrigation pipes and groundwater sources. Using sound waves, the sensors can detect and pinpoint leaks in irrigation pipes below the ground, as well as accurately measure a farmer’s groundwater storage. Ag data analytics use the massive amount of information from imaging and/or sensor networks to assess and predict field conditions. Computer use and access to the internet have not only given farmers tools to more precisely irrigate their crops but have also provided a forum to communicate with other farmers about farming issues such as water-conversation. Social networking and mass text messaging have been successfully used in other industries for communication but is now also starting to be used more widely in agriculture. Studies show that farmers rely on their social network as a primary information source. 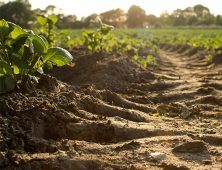 Farmer-specific social networking platforms are attempting to leverage this natural tendency by encouraging farmers to share their questions and knowledge with others in the industry on issues including water use, irrigation tools, and weather information. This approach shifts from water management and conservation techniques to water reuse. Water purification and desalination (a process that removes salt and minerals from water) has been around for decades and is used in mostly arid countries around the world. Israel is a major proponent of water reuse — reusing about 80% of its municipal wastewater for irrigation. Israel not only reuses grey water from sinks and showers but also uses black water – better known as sewage. Following the Israelis lead in water reuse is Spain at 17%, followed by Australia at 10% and the U.S. at less than 1%. In addition to water reuse, desalination provides another major water source for Israel. Breakthroughs in membrane technology have lowered the cost of desalination technology significantly. The World Bank reported advances in membrane filtration have lowered the cost from $1 per cubic meter to 50 cents per cubic meter in less than five years, making seawater desalination considerably more affordable water source option. 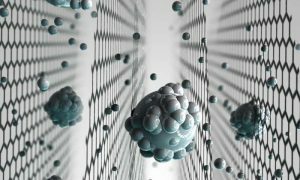 Graphene membranes can be used for water filtration, gas separation and desalination projects. There are a few startup companies working on membrane technology. Most startups or academics that develop promising technologies typically sell it to large companies such as LG Chem, AquaTech, Koch Membrane Systems, Inc., Evoqua Water Technologies, Marlo, Incorporated, and The Dow Chemical Company are already heavily invested in the water utility markets. The most popular membrane technology is reverse osmosis – a process that uses a semipermeable membrane to remove ions, molecules, and larger particles (salts) from drinking water. Historically, the reverse osmosis process used a lot of energy, but newer membrane technologies (e.g., nanomaterials and graphene-oxide membranes) and solar powered electrodialysis are able to filter seawater using significantly less energy (although some of these technologies have obstacles to overcome before becoming commercially available). One of the most unconventional, exciting and innovative approaches is to add a biodegradable sponge in the soil. 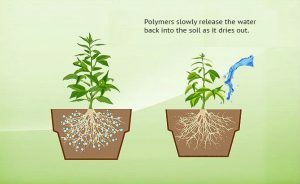 These super absorbent polymers that farmers can put in their soil ahead of planting are slowly gaining popularity. The size of a grain of sand, a polymer particle can soak up to 250 times its weight in water. Absorbing the excess water left behind from crop irrigation, the polymer then slowly releases the water back into the soil as it dries out. Developed at Stanford University, one such polymer is said to help farmers reduce water use by 20 percent and cut water bills by 15 percent. Environmentally, the polymer lasts about a year before it starts to break down without leaving any by-products behind. 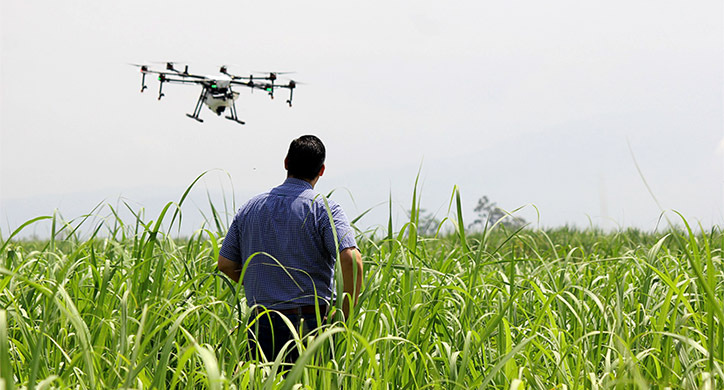 Innovative water monitor and water saving technologies, from drones to sensors, filters, and polymers, are providing ways for farmers to manage, conserve and protect the Earth’s water supply.